With the proliferation of personal electronics and a host of other technical applications, the demand is high for small, lightweight cooling products. Our frameless fans are quiet, consume minimal energy, and effectively reduce heat to safe levels. Cost effectiveness — Frameless fans produce less friction, lowering noise levels and increasing their overall lifespan. They also use less power, which saves battery power in portable applications. More aesthetically pleasing — With the reduced noise and mechanical friction, frameless fans are more pleasing to work with than their counterparts. They are also styled in the design of ceiling fans for a nice aesthetic touch. Highly versatile — Frameless fans can work at different operating temperatures. Standard models work anywhere between -10°C and 70°C, and custom models with ranges extend to as wide as -35°C to 90°C are available. 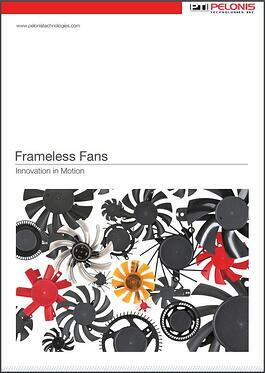 Design flexibility — There are many different design options available for our frameless fans. These include dust, moisture, and salt fog protection, as well as dual ball or proprietary bearings for improving reliability, performance, and longevity. Additional options include Tachometer and Pulse Width Modulation speed control. Frameless fans represent premium quality and design for custom cooling in limited spaces, uniquely engineered to fulfill the cooling requirements of virtually any application. To learn more about our new line of frameless fans, download our free Product Catalog or contact us today.